The current west Windsor bus depot as seen on Google Streetview. The west end terminal for Transit Windsor is looking for a new home. The terminal has been located across from the former College Avenue Community Centre at the corner of College Avenue and Brock Street since it moved off of Mill Street in 1998. The 12,500 square foot site accommodates a six bus bay platform, bus shelters and parking, and is a west end transfer point for the Crosstown 2, Transway 1C, Central 3 and South Windsor 7. Transit Windsor also leased an approximately 400 square foot lunch room area inside the community centre used by Transit operators for their breaks. In late 2014, Transit Windsor was advised by the City of Windsor that Windsor Essex Community Health Centre would eventually be occupying the CACC facility and that Transit Windsor would be required to vacate the terminal site location. Since then Transit Windsor has been actively looking for an alternative location for the west end terminal. As an interim measure, Transit Windsor set up a trailer at the end of September at the CACC site as a temporary location for its operators. 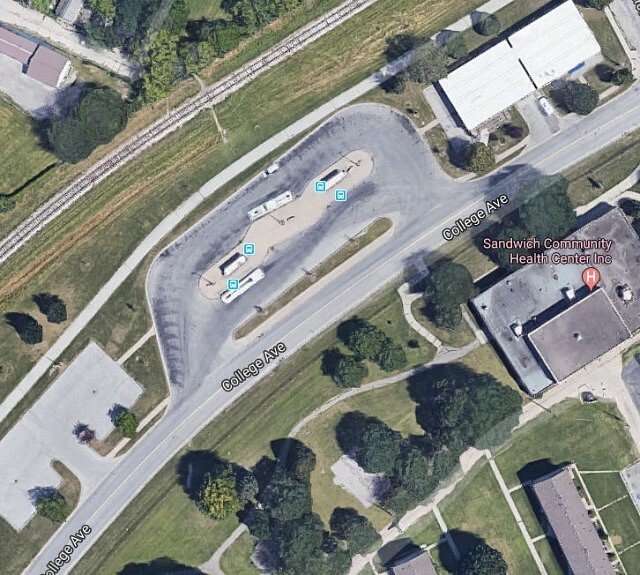 According to an administration report, a number of sites were considered with little interest for partnering with Transit Windsor to house a terminal site. Recently, Administration says that they have had preliminary discussions with Hotel-Dieu Grace Healthcare Hospital regarding their site located at 1453 Prince Road around the possibility of locating the west end transit terminal at the Tayfour site. This would require the construction of a 4 to 6 bus bays, pedestrian platform with shelters, and provisions for a room located inside the hospital to accommodate transit operators for their breaks and lunches. Administration says that there are many benefits to this location which include better route connectivity, continued revitalization of the area and providing direct access to healthcare to patients, visitors and staff. The facility would also allow for passengers with longer layover times to use the hospital facility as an indoor waiting area, complete with cafe. The next step is for council to grant administration permission to negotiate a licensing agreement with Hotel-Dieu Grace Healthcare Hospital and to engage in any resulting contract negotiations. The Environment, Transportation & Public Safety Standing Committee will receive the report on January 24th and it will head to council following their vote.